Grey Eagle spent the majority of his life studying the culture of his people, the Cherokee, and the cultures of other Indigenous people of North America. As an educator, his dream was to share some of his knowledge with as any people as possible. This virtual museum exhibits a host of stone carvings and flint artifacts, with explanations of their uses in times past. 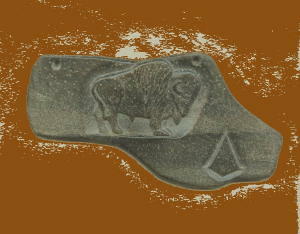 The images that you see here are Grey Eagle's re-creations of ancient artifacts. They were created for the purpose of education and for appreciation of the lives of his ancestors. Funding for the GREY EAGLE MUSEUM came from donations, the sale of art work that Grey Eagle donated to GEM Foundation, Inc. and sponsors who want to see knowledge saved and passed on to future generations.